The MSRB is hosting an education and outreach seminar on Tuesday, January 24, 2012 in Miami, Florida. In early January 2012, the MSRB will begin accepting applications for seven open positions on its Board of Directors. Check MSRB.org for updates. EMMA users can search for municipal bonds based on their credit rating. Learn how. In November, the MSRB began providing free public access to current municipal credit ratings on its EMMA® website. The ratings, from Fitch Ratings and Standard & Poor’s, are displayed on EMMA for all individual municipal securities that have ratings assigned by the two agencies. 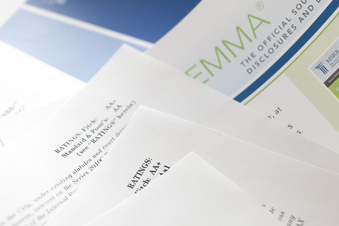 EMMA displays long-term credit ratings for individual securities, along with any short-term rating, underlying or unenhanced rating, credit enhancement features or other information that may be provided. Watch a video about ratings on EMMA. To make it easier for market participants to submit and view comments on MSRB rulemaking initiatives, the MSRB has created an electronic comment form and consolidated all requests for comment on a single page on the MSRB’s website. The Requests for Comment page on MSRB.org, which can be accessed from the Rules and Interpretations page, contains a list of all MSRB Notices for which the MSRB has sought or is seeking public comment. For open requests for comment, commenters can now submit comments through an online form rather than through email. For notices for which the comment period has closed, all available comments can be viewed. All notices containing requests for comment will continue to be listed on the Regulatory Notices landing page on MSRB.org. On November 28, 2011, the revised provisions of MSRB Rule G-23, on activities of financial advisors, and a related interpretive notice became effective. On December 8, 2011, the Federal Reserve Board released its Flow of Funds Accounts report, which included updated data on the size of the municipal securities market and holders of outstanding securities. Due to new data and methodology used, the Federal Reserve estimates the size of the municipal market at $3.7 trillion at the end of the third quarter 2011, significantly higher than the previous estimate of $2.9 trillion. According to the new estimates, the household sector now holds approximately half, or $1.9 trillion, of the overall $3.7 trillion outstanding. 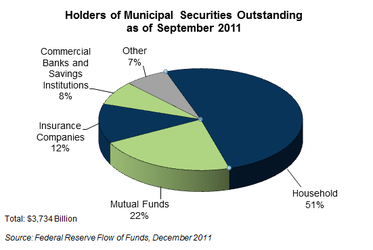 Mutual funds and money market mutual funds holdings account for approximately 22 percent of all municipal securities outstanding. Access the latest Flow of Funds Accounts report.